Intraoperative Imaging in Neurosurgery: Where Will the Future Take Us? 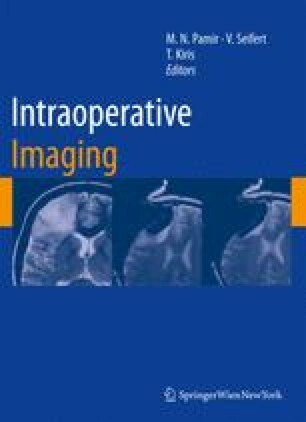 Intraoperative MRI (ioMRI) dates back to the 1990s and since then has been successfully applied in neurosurgery for three primary reasons with the last one becoming the most significant today: (1) brain shift-corrected navigation, (2) monitoring/controlling thermal ablations, and (3) identifying residual tumor for resection. IoMRI, which today is moving into other applications, including treatment of vasculature and the spine, requires advanced 3T MRI platforms for faster and more flexible image acquisitions, higher image quality, and better spatial and temporal resolution; functional capabilities including fMRI and DTI; non-rigid registration algorithms to register pre- and intraoperative images; non-MRI imaging improvements to continuously monitor brain shift to identify when a new 3D MRI data set is needed intraoperatively; more integration of imaging and MRI-compatible navigational and robot-assisted systems; and greater computational capabilities to handle the processing of data. The Brigham and Women’s Hospital’s “AMIGO” suite is described as a setting for progress to continue in ioMRI by incorporating other modalities including molecular imaging. A call to action is made to have other researchers and clinicians in the field of image guided therapy to work together to integrate imaging with therapy delivery systems (such as laser, MRgFUS, endoscopic, and robotic surgery devices).